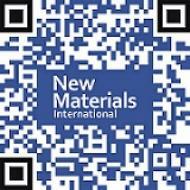 New Materials International, first established in 1988, is a leading international source of information and developments in advanced materials and their applications. The archive is a rich and valuable information resource for anybody involved or interested in the development and application of new and advanced materials. The readership of New Materials International includes users, specifiers, installers and equipment suppliers throughout the world. Editorials include technical features, product reviews and topical news commentary from the world of materials. New Materials International welcomes news and article submissions for publication and welcomes the opportunity to interview key figures from the materials industry.